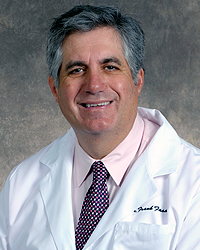 Frank J. Fasano, MD is a board certified orthopedic surgeon. He is originally from New York City. He has practiced in the greater Dayton area since 1988. He is a highly skilled and experienced surgeon with excellent outcomes, having performed thousands of procedures. General orthopedic and reconstructive surgery. Dr. Fasano performs total knee and hip replacements. He also performs many outpatient surgeries such as knee arthroscopy, shoulder arthroscopy and rotator cuff repairs. He provides general orthopedic and fracture care. Dr. Fasano develops individualized treatment for each patient allowing them to be an active participant in their care. He recommends the least invasive treatment option for patients before advancing to more complicated treatment such as surgery.